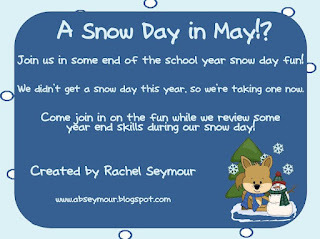 A - B - Seymour: Snow Day in May and a FREEBIE! Happy Mother's Day to all of you wonderful, hard-working moms! I don't know how you do it all. :) A special Happy Mother's Day to my beautiful mama and mother-in-law too! I'm a lucky girl! Well, my kiddos and I thought it would be fun to create our own snow day so we're having one in May! 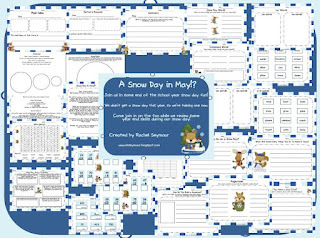 We're going to be reviewing some first grade skills with some snow day themed fun. Everything in this pack is ready to use! There is no cutting or laminating to do! That's what we need at the end of the year....simple and ready to go. 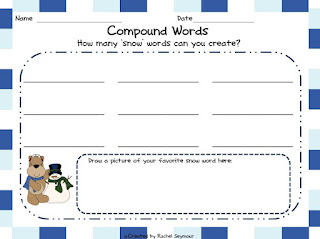 The only materials you will need are construction paper for the snowman and snow cone ingredients! I've included an easy snow cone recipe in here to end the day with, but I just bought snow cone flavoring. It's up to you! There is also a parent letter because my kiddos will be allowed to wear their winter items if they want to and bring sunglasses to wear while we enjoy the snow cones! If you live in an area that doesn't get any snow, this could be your chance for a snow day!! At the very least, it will add some fun to your end of the year routine...and review some important skills while you're at it. This sounds like a lot of fun! I live in the desert and we had one fluke blizzard about 4 years ago. That will probably be my only Snow Day I will every have here. I never thought to make my own Snow Day. Great idea! Thank you for the freebie! Very cute idea! I am originally from Kent and now I live in Southeastern Ohio. We only had 1 snow day this year. Usually we have 5-7 days off. Thank you for the comment on my blog! I'm so excited to have a fellow Northeast Ohio-an blogger friend! I love all your ideas and packets on TpT. Didn't we have such a crazy winter this year? I think this was the first year we didn't have a single snow day either! Do you know any other Ohio bloggers? We should have an Ohio blogger meet-up! I always see other states doing that and I'm jealous! This sounds like so much fun!! Thanks for sharing!